Trying to find some new recipes. I actually bought “The Complete Cook’s Country TV Show Cookbook” and found this recipe along with several more. Gotta do something to get of Twitter!! The best place for destressing is my kitchen. Why not try some new recipes while I am at it! Here is a “Simple and Delicious” meal! Combine orange juice, vinegar, soy sauce, ginger, sugar, and chili-garlic sauce in bowl; transfer ½ cup orange juice mixture to 12-inch skillet. 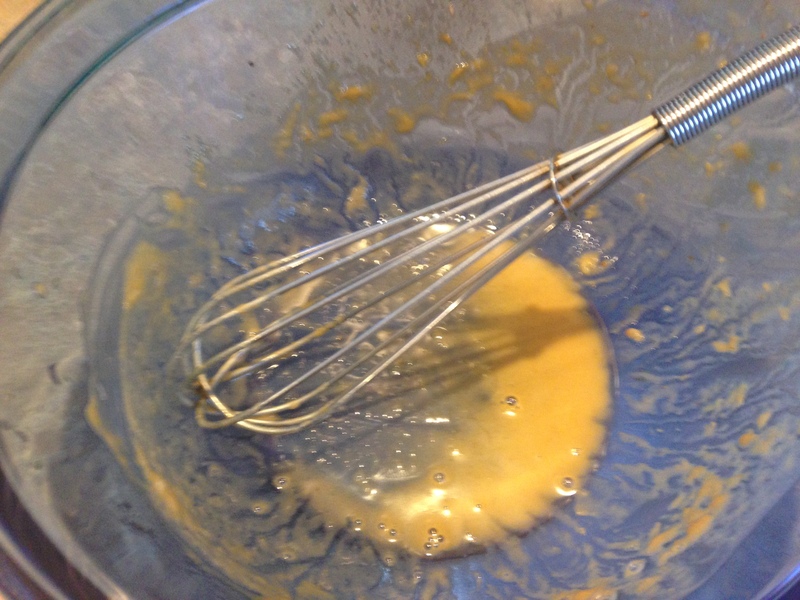 Slowly whisk vegetable oil and sesame oil into remaining orange juice mixture to make vinaigrette; set aside. Bring orange juice mixture in skillet to boil. Add chicken, reduce heat to medium-low, cover, and simmer until meat registers 160 degrees, 10 to 15 minutes, flipping halfway through cooking. Transfer chicken to plate and let rest for 5 to 10 minutes. Meanwhile, boil pan juices until reduced to 1/4 cup, 1 to 3 minutes; set aside. Using 2 forks, shred chicken into bite-size pieces. Off heat, add chicken, any accumulated juices, and 2 tablespoons vinaigrette to skillet. Toss to coat and let sit for 10 minutes. 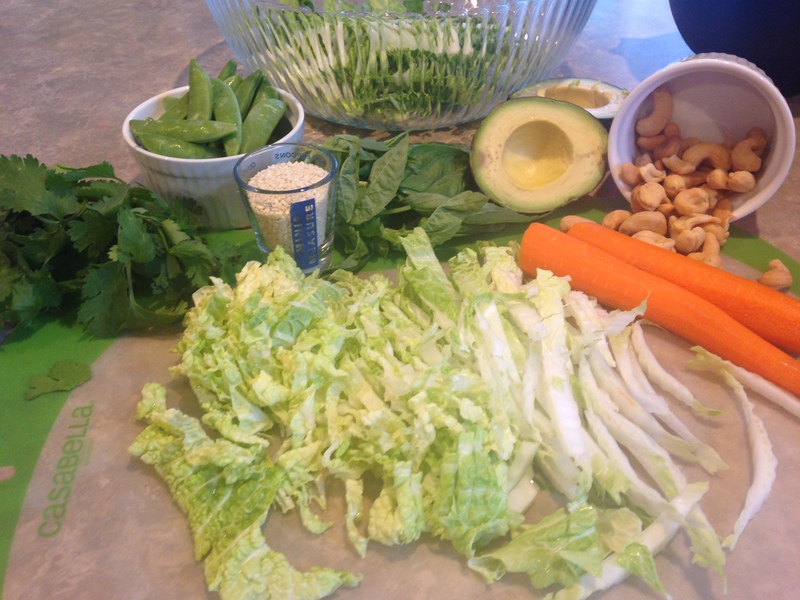 Toss romaine, cabbage, bell peppers, cilantro, peanuts, and scallions with remaining vinaigrette in large bowl. Transfer to serving platter and top with chicken and oranges. I did not mix all together. I put the cabbage, romaine lettuce and red peppers in a large salad bowl. The cilantro, peanuts and chicken in separate bowls. That way people can take what they want. This salad did take some time but it’s Sunday and that’s what they are for – taking your time. It definitely was delicious!! This is a very easy and quick salad. Place sliced cabbage in medium bowl. Add 1 teaspoon salt and mix well. Let set for 15-20 minutes until cabbage wilts. Add oil and vinegar. Mix well. Enjoy! Sometimes the basics is all you need. If you want to add some onion and green pepper that is a nice addition. Enjoy with a buttered roll. Simple and Delicious!! I eat lots of salads. Here is a very simple and delicious dressing. Shake all ingredients in a tightly covered container. Refrigerate at least 2 hours. Shake before serving. Told you it was easy!! Bring potatoes to a boil in large pot of water. Cook until tender and drain. 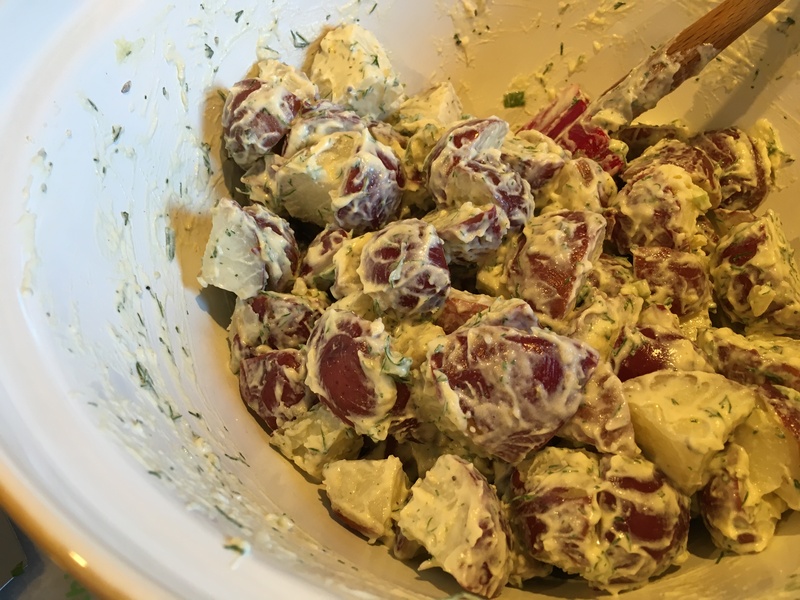 Place potatoes in in bowl and put 1/4 cup of the Italian Salad Dressing over the potatoes. Mix together and place in refrigerator for 30 minutes to cool. While potatoes are cooling, in a large bowl, combine all above ingredients, including the other 1/4 cup of the dressing. After 30 minutes of cooling, place potatoes in the large bowl and stir until coated. Place in refrigerator for a couple of hours for the flavors to blend together. That is it. Very Simple and Delicious. Enjoy!! 1. Whisk sugar, vinegar and oil in large bowl. 2. Add remaining ingredients and toss to combine. 3. Cover and refrigerate at least 4 hours, tossing occasionally. 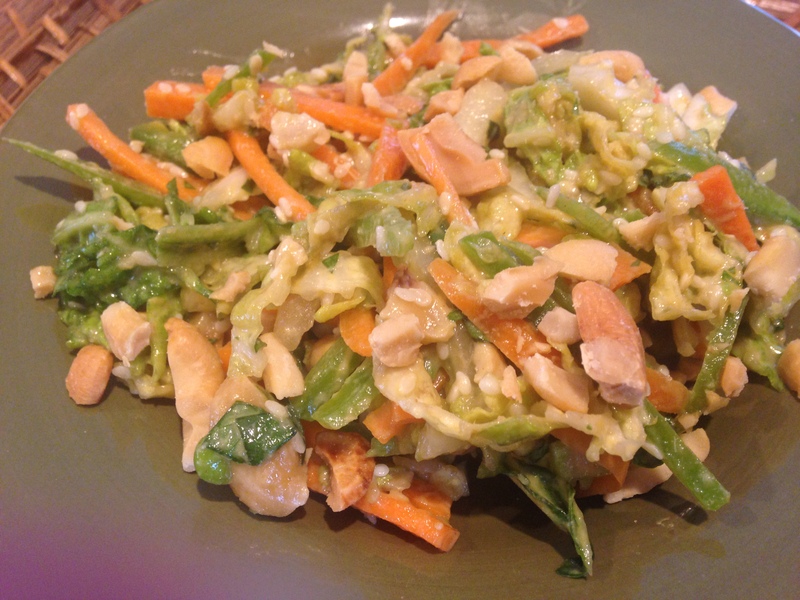 Here is a very simple salad that Martin had very often at home with his grandparents. Totally simple and again delicious. Throw above veggies in bowl. Crumble feta over salad. Drizzle with olive oil and a touch of salt. (Feta tends to be salty enough!). We mix with our hands (Shhh, don’t tell anyone) and serve. Enjoy! 1. Combine all salad ingredients in large bowl. 3. 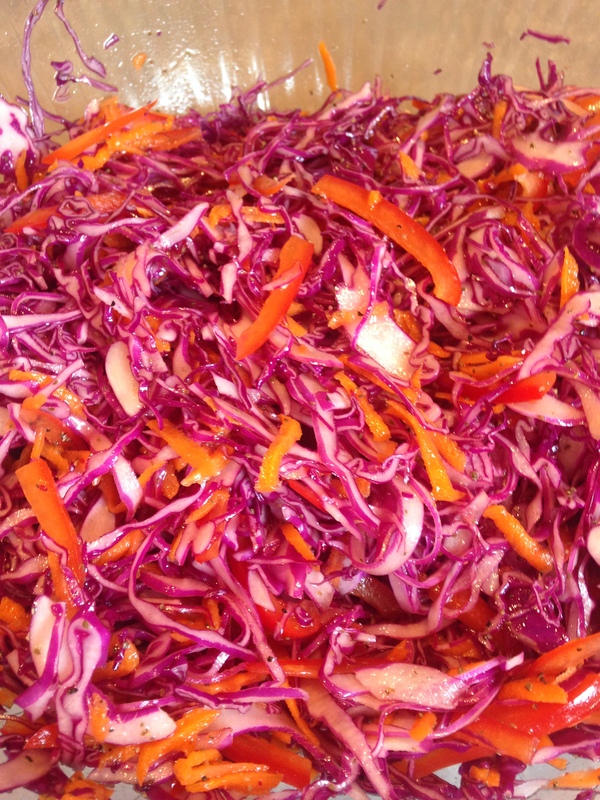 Toss cabbage mixture with dressing. If you want to top individual bowls with more herbs or chopped cashews, go for it! 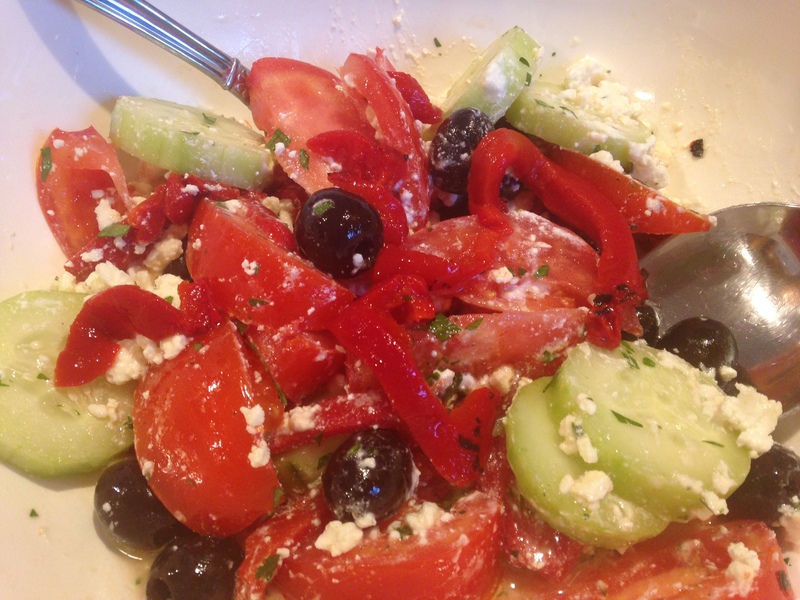 This salad will be made a few more times this summer. 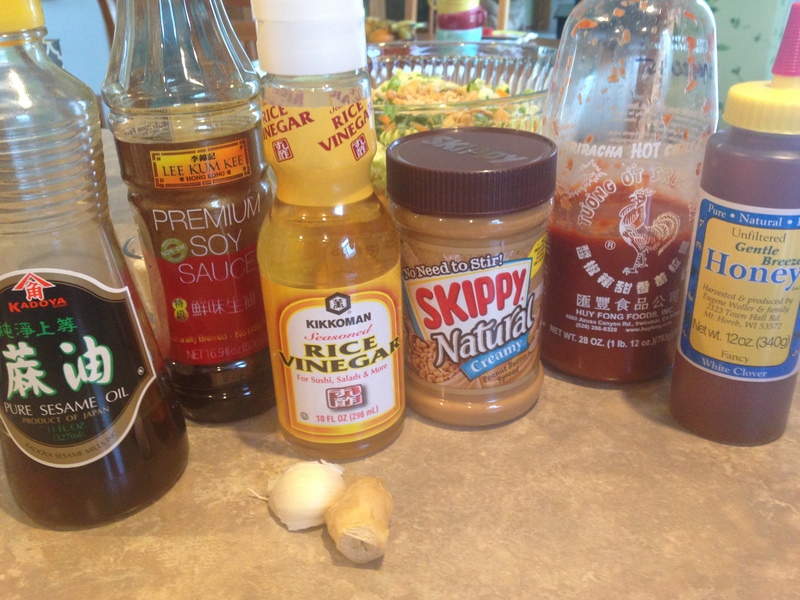 The next time I make the dressing I will add an extra teaspoon of honey and a tablespoon of sriracha sauce. We like spice in this house! Enjoy this simple and delicious salad! I am on a health kick. Salads are good for us, right? Here is a salad Kent and I tried the other night. It was quite flavorful and Simple and Delicious. Give it a try. Mix all together. You do not need any other dressing as the salt, lemon and avocado will blend together and make a creamy dressing. However, I added raspberry balsamic vinegar. 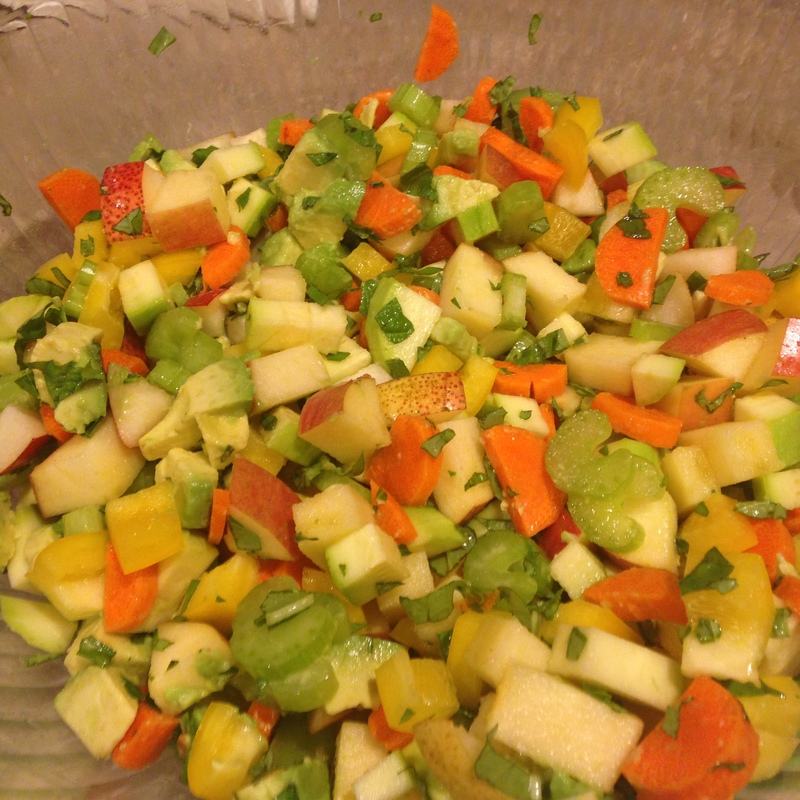 What an awesome flavor to add to this refreshing salad. So simple and so delicious. Great for the summer. 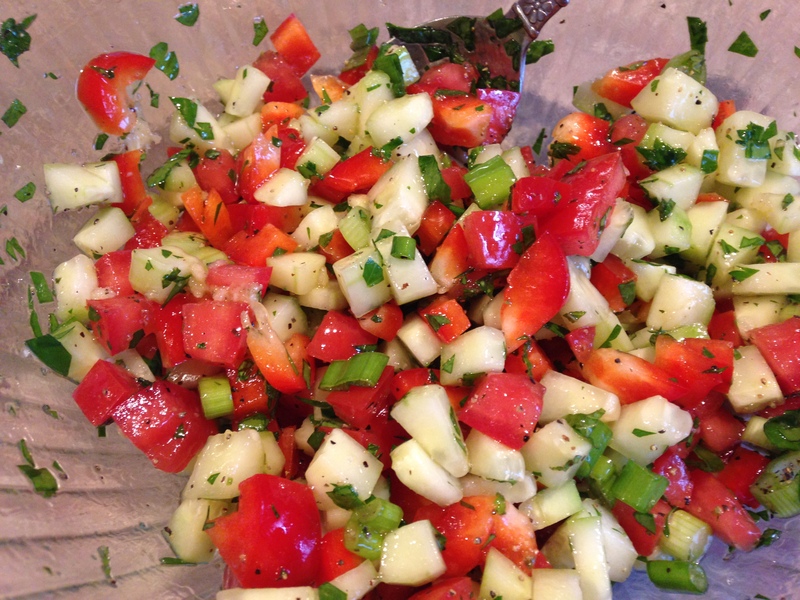 Go to your farmer’s market and make this quick salad for lunch! Directions; Mix all together and that’s it!! This is so refreshing. Feta, Parmesan, cheddar or any cheese is also a great addition. Personally, plain with a piece (or two) of fresh baked bread works for me. LOVE it! !